This item will change its color by detecting water temperature. So far this faucet's been working perfectly fine. I've never had any issues with it, save for the handle which felt a bit flimsy. Sometimes I think I could break it off if I want to. Nonetheless, it works well and seems to be of good quality. The LED lights are pretty nice as well, though they're not really that bright. I ordered this faucet because I thought the design looked really cool, and even now, every time I see it, I still think the same way. However, one of the reasons why I got this was because of the LED lights. However, I am quite dismayed because they're hardly noticeable especially when the bathroom lights are on. If you're trying to build a modern and contemporary space, I would highly recommend this one. I order this a couple of weeks back and had it installed when it came. Right out of the box, it looked good, but sitting there in the sink and this was just perfect. It was great that i got this one at the sale, which helped me to save about a hundred dollars or so. Definitely a good product and worth it. 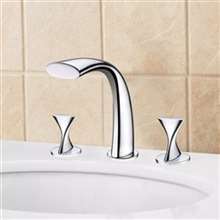 This is a gorgeous faucet, with a nice unusual design. The LED lights give it an extra charm, it's really a great addition to our bath. The installation went smooth, everything works great!